This week we’ll look at pundits making claims that aren’t really backed up. Remember when Windows 8 was going to change everything? Meanwhile, a small sliver of the market clearly shows how Apple’s getting left out in the cold. Again. Finally, if it’s August then it must be time for problems with the fall iPhones. Let us begin with a pair of bookends to Windows 8, both brought to us courtesy of the Boy Genius Report. Strong words! Wonder how that turned out. Well, here’s the Boy Genius Report’s Brad Reed in 2014, which is this year. The now. What’s happening currently. Why did Windows 8 fail? It had to be explained to users. What? That can’t be right. You’re a liar, Brad. A dirty, rotten liar. While Microsoft did its best to make significant improvements to the platform with its subsequent Windows 8.1 and Windows 8.1 Update releases, the company is mostly now ready to move on from Windows 8 by releasing Windows 9, which will reportedly bring back many of the key desktop features that PC owners say they sorely missed with Microsoft’s first touch-centric OS. The reception, as you’ve likely read by now, has been overwhelmingly positive. In fact, Apple bloggers were apparently so flustered by the platform that they resorted to bombarding Twitter with jokes about cooling fans and Silverlight instead of stopping for a moment to realize that Microsoft is showing us the future of computing. Uh-huh. Surely what happened was that people just weren’t ready for the future, which is too cool and super-awesome for them. Those not as pie-eyed as Epstein could have seen that there were some problems with this vision right out of the gate. Some people would rather have one device, but what more people want is devices that work well. And you can’t make one interface that’s optimized for touch and keyboard and mouse input all at the same time. Question: Why does Microsoft think that 2-in-1s are the future? Answer: Because they have to. It’s the only way they can justify the use of Windows 8 on a tablet. They say that form follows function. That’s true unless you’re Microsoft, in which case it follows that strategy you made up and can’t walk away from. Reinhardt Krause of Investors.com has a dire warning for Apple! Yes, another tiny slice of the market threatens doom! “Apple May Miss Boat If iPad Doesn’t Do Voice Calls” (tip o’ the antlers to Neil Weinstock). The boat to where, exactly? Seven-inch screen and larger tablets with built-in, cellphone calling capabilities are gaining traction in Asia, says research firm IDC. So that’s IDC. What does NPD say? IDC, NPD, let’s call the whole thing off. Apple is expected to launch the iPhone 6 on Sept. 9, including a 5.5-inch-screen phablet version. Expected by some. Others think the company will just launch a 4.7-inch iPhone. Hey, it’s still possible it won’t launch a larger phone at all! Wouldn’t that be something? Oh, my God, that would be fun. The Macalope would be busy for weeks, if not months. While iPad users can get Skype voice-over-Internet service, the tablet does not now have cellular voice service capability. Right. Because holding a tablet up to your head is dumb. Hold a tablet up to your head and look in the mirror. You look like a lunatic. You’re talking into a tablet and you’re doing it in the bathroom. Who does that? What’s wrong with you? Taiwan’s Asus is a leading supplier of cellular-capable tablets, as is Samsung, the No. 1 maker of smartphones based on Google ‘s open-source Android operating system. Pretty sure “open-source” should be in sarcastic quotes there. 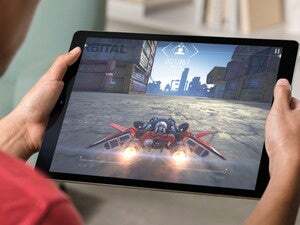 According to IDC, in Q2 more than 13.8 million tablets with 7-inch screens or larger were shipped in Asia-Pacific, excluding Japan. Pff. Japan. Who cares about them? Since, you know, that’s the Asian country where Apple does the best. Nearly 25%, or 3.5 million units, had voice calling over cellular networks built into the device, up 60% from the year-earlier period. Apple, of course, sold 13 million iPads in the same quarter, but it should really be concerned about these 3.5 million freaks of nature, these Island of Dr. Moreau-esque atrocities, because it doesn’t make those, and Apple should always make the thing it doesn’t make—otherwise, doom. While IDC says this category is getting larger, it also says it’s unclear not only how many people are really buying the tablets for the cellular capability, but also how many are actually using it. In other words, are people buying them because they’re big honkin’ cell phones, or are they just buying Asus and Samsung devices because of their local brand-name recognition? Apple is not going to chase every feature down every rabbit hole. That’s actually a good thing. It’s late summer so you know what that means: time to report on all the problems the yet-to-be-released iPhones are having. Take it away, Reuters. It’s unclear whether the hiccup could delay the launch or limit the number of phones initially available to consumers, the sources said, as Apple readies larger-screen iPhones for the year-end shopping season amid market share loss to cheaper rivals. Uh-huh. It’s unclear if this will have any effect at all. Got it. So, how does Forbes “contributor” Gordon Kelly report it? “iPhone 6 Production Delayed, Claims Reuters. Risks Troubled Launch” (no link, naturally). APPLEBLAZZLEFROZZLE! Kelly, of course, doesn’t really know if production was delayed. It’s possible that Apple builds time into its schedule for such problems—heck, we always seem to get some dire report around this time of year about how the new iPhones are screwed because of production problems. It’s also possible Apple made up time somewhere else. But you can always count on the staid reporting—or, well, re-reporting—of the Forbes contributor network and circus-geek rehabilitation program. Apparently, apart from suffering from severe manufacturing defects such as the SIM tray not working properly, exceptionally low screen quality for a smartphone which is supposed to have Gorilla Glass 3, troubles with the microUSB port, and unusually high overheating issues, the phone is also suffering from some serious software bugs, such as contacts mysteriously not showing up when accessed through the dialer app, and several other complaints of unstable software and random WiFi/cellular signal drops. Xiaomi, of course, is widely regarded as being an Apple-killer because its phones are so cheap and look like iPhones. Kind of like those cardboard inserts with an image of an iPhone printed on them that come inside the iPhone case you bought. Why even buy the iPhone, really? This piece of cardboard looks just like it! You know what happens every year? Every year a new iPhone launches and it sells really well and Apple has trouble meeting full demand. It’s probably going to happen again this year. If it happens every year, is it really news?